My parents and I got to have dinner at Macaroni and Grill thanks to a generous gift card, and I really enjoyed their mushroom ravioli. Everyone could tell, since my plate was nearly spotless when I finished! On Tuesday, my mom and I headed south for Solvang and Santa Barbara in my parents' nice new Subaru. On the way down we stopped at Pismo Beach. 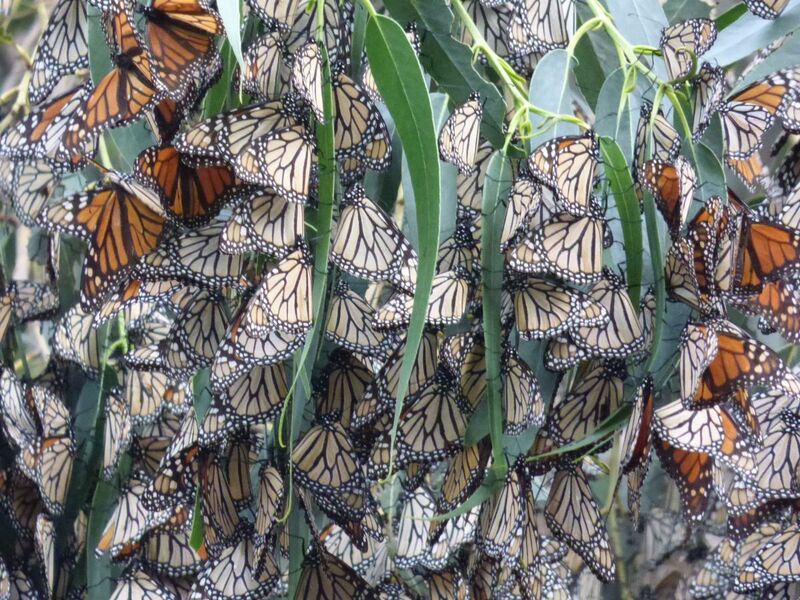 Near the shoreline, on a bunch of eucalyptus trees, is a place where thousands (@20,000 when we were there) of monarch butterflies come from as far north as Canada to spend the winter. It was neat to get photos of the amazing sight as well as marvel over their ability to all find that place! Also neat that volunteers had some high-quality spotting scopes set up so that visitors could get a very clear look, as the butterflies weren't near the ground. Also grateful for safe travel there and back during the around 6 hour drives between Sacramento and Solvang, and the great time we had together.